Experimente la belleza de St-Emilion en bicicleta en este tour de un día de degustación de vinos desde Burdeos. Comience con una visita guiada a pie por esta ciudad declarada Patrimonio de la Humanidad por la UNESCO, y luego disfrute de un paseo en bicicleta por el verde paisaje. Conozca la historia de la región vinícola de St-Emilion mientras pasea por los famosos castillos, visite un viñedo encantador para almorzar y una clase de cata de vinos, y visite una finca de crecimiento clasificado para degustar excelentes variedades locales. Explore St-Emilion, declarado Patrimonio de la Humanidad por la UNESCO, en una visita guiada a pie. Ver castillos como Petrus y Cheval Blanc. We really enjoyed our day on the bikes traveling through the grape fields and in to St Emilion with Jerome as our guide. He was extremely knowledgeable, friendly and helpful. The day was amazing! Shout out to Jerome’s Mom - you raised a great son! Wonderful bike tour followed by a delicious lunch in the chateau's garden, a lovely setting. The staff was professional and friendly. You don't need to be an expert biker we would do it again. Superbe excursion que je recommande à tous. Départ de Bordeaux en mini bus. 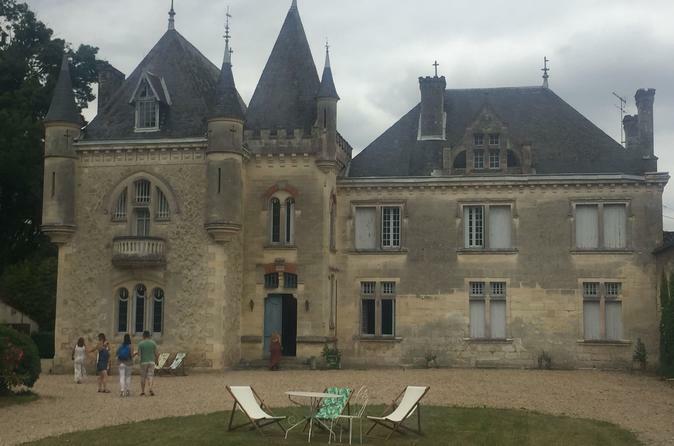 Arrivée au 1er château château Baleau pour une balade en vélo dans les vignobles. Retour au château pour un excellent dîner dégustation de vins 1 blanc et 2 rouges. 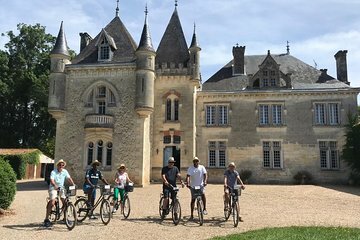 Seconde balade en vélo avec arrêt à St-Émilion puis visite d'un 2ième château et d'une autre dégustation de vins 2 rouges. Retour au 1er château puis retour en mini bus à Bordeaux. Arrivée vers 19h00. Super groupe petit et excellente guide, flexible. Overall it was very enjoyable. Low impact, easy ride and beautiful scenery. Our tour guide Soline was wonderful. Very knowledgeable and funny and charming. Great way to spend the day. St. Emilion was quite a surprising town. My suggestions, for a party of eight, a little more food would be appreciated. And more wine. I'm sorry, but 3 bottles among 8 people at lunch did not cover it. We had to buy an additional bottle for table. We took a similar tour in Tuscany and had a much larger group and wine was flowing easily. This was a wonderful bike tour of two great wineries as well as a small, but beautiful, village. This was an easy bike ride with lots of rest, their are no steep, or even slightly steep, hills to ride. The bikes are geared so there is no need to walk your bike, I must say you do need know how to ride a bike, but the riding is easy. Our group had seven people which seemed to work out great, our guide stopped at a number of different grape orchards and explained about the different varieties of wine grown in the region we visited and the various classifications. The two wineries we stopped at were wonderful, each having great wines to taste. The lunch was great and set up on the grass underneath shade trees at a winery. This is a great wine tour to go on, easy riding, wonderful wineries and lunch plus very knowledgable guides!! Book it, you'll be glad you did!! We enjoyed this tour immensely. Lovely group of people and our guide Dora-ly was fantastic, very informative and pleasant. Cycling was easy and great way to view the countryside. Lunch at the chateau was beautiful and a wonderful setting. Great tour, a must. We ended up having 5 people for our group and this size was perfect. Our group leader, Nathan, was passionate and very knowledgeable. The food was excellent and the scenery was beautiful. You should be in relatively good shape for this tour. Easy biking, nice small group of people, great lunch and excellent wine. Ticked all the boxes with a friendly and informative guide.